Cruise Faxaflói Bay in a rigid inflatable boat (RIB) on a 2-hour, small-group whale-watching expedition from Reykjavik. Board a speedy RIB at the Old Harbor, and skim alongside graceful seabirds as you pass seasonal puffin colonies. Watch for minke and humpback whales, porpoises, and white-beaked dolphins, and then return to the harbor along the Reykjavik shoreline. Pause alongside the Harpa Concert Hall and the Sun Voyager sculpture as you take in the city’s most distinctive sights from the water. We had a very nice boat ride. Loved the RIB boat! Our tour was cancelled due to weather conditions and the staff worked to find another time the next day that worked for us. We unfortunately did not see whales, but did see North Atlantic Dolphins and puffins. Our guide was very nice and had lots of great information. The weather was perfect and we enjoyed a peaceful sea and wonderful pre-sunset. Highly recommend. We LOVED this tour! The giudes were awesome and the boat ride was a blast. It's extremely cold so bundle up they provide warm items as well. We saw whales, porpoises and puffins. Definitely recommend! The boat ride was fast and fun and we did see a few whales for a brief second surface. 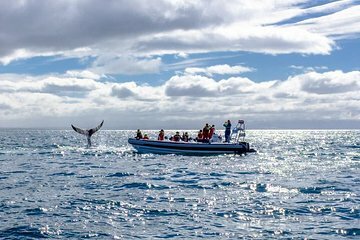 It is a lot of money to take a chance at a few seconds of spotting a whale but if you love fast boat rides and have never been on the ocean this is a great trip. They tried very hard to get a whale sighting. You never do get to see the back fin or them jumping up in the air. That's probably at SeaWorld! This was an amazing experience. when we first set off i had so much fun on the rib that i was thinking it wouldn't even matter that much if we didn't see any whales even though it would have been disappointing. however, the guide was excellent and knew where to look. we ended up seeing humpbacks as well as harbour porpoises which was amazing. the guide's own excitement at seeing the porpoises was tangible which made it even nicer as you could really feel their passion for the job as well as them being knowledgeable and passing that info onto us without it being an overload or interrupting the watching side of the experience. We loved this tour and even took it a second time a few days later. It was wonderful to be out on the water, and the suits they provided kept us nice and warm. We also enjoyed seeing Puffin Island. We saw whales on both trips, the second time hunchback whales. The zodiac boat was super. We saw 6 wales !!! Mink wales and Hunchbackwales and also Puffins. Super !!!! We loved our RIB experience. Despite the rain and overcast weather we saw a humpback whale, playful dolphins, a minke whale and hundreds of birds... including the clumsy puffin. Our guides were wonderful, especially with a passenger experiencing seasickness... would so recommend the RIB trip! !